1. 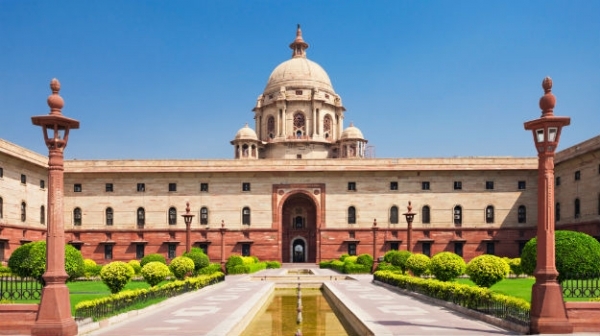 After the Quirinal Palace, Rome, Italy, Rashtrapati Bhawan in New Delhi, India is the second largest in the world. 2. Started in 1912, the monument took a time span of 17 years for its completion. It also took about 29,000 workers and was finally completed in 1929. 3. Two villages namely Raisini and Malcha were cleared in order to build this by an architect named Sir Edwin Landseer Lutyens. The place on which it is built is now called the Rasina Hill. 4. Before India’s independence it was called the Viceroy’s House and is the largest residence in India till date. 5. Every year in February, the Mughal Garden behind the Rashtrapati Bhawan is opened during a festival known as Udyanotsav. 6. A statue of Gautama Buddha which belonged to the Gupta age around the 4th and 5th century was kept at the back of Durbar Hall in the Rashtrapati Bhavan. 7. The Rashtrapati Bhawan has one of the grandest banquet halls in which 104 guests can be seated at one time. But that is not all, it consists a secret gallery for musicians and there is special lighting in the hall. These lights are placed over portraits of former presidents which serve as a signal to butlers so as when to serve, when to clear the hall and when not to serve. 8. King George V’s silver chair on which he sat at the Delhi Durbar in 1911 and weights around 640 kg is kept at the Gift Museum in the Rashtrapati Bhavan. 9. The presidential palace also has two galleries for children. One gallery consists of work done by children whereas the other one consists of work done for children. 10. The science and innovation gallery of Rashtrapati Bhavan has a robotic dog called Clumsy which is as close as it gets to a real dog!